In our article "Connecting an Extension to the House" we touched briefly on ways of linking an extension to other, separate buildings. In this article we'll look at different ways of doing this in more detail. The situations that we'll be looking at will almost always be linking an extension building to the main house. It could occasionally be to bring two outbuilding extensions together but the issues and solutions are likely to be broadly similar. There are three main areas to consider when linking buildings. The first is the purpose. Are you looking to tie the extension to the house for purely visual purposes? Or is the intention to provide some shelter from inclement weather while walking between the two buildings? The second aspect is the style, which materials to use to construct a walkway that will enhance the house, extension and garden without detracting from the whole. The third aspect is the administration, whether or not you will need planning permission or building regulations approval for the walkway. This depends on how solid the structure is. If, for example, you put a pergola up over a garden path it's unlikely to need any permissions. Similarly if you put up a completely roofed and walled structure with a paved walkway, doors and electric lighting, then you're definitely into building control and planning territory. It's the middle ground where it can be difficult to know where you stand. How Much Protection from the Elements? If you're considering a covered walkway then it is likely to be because you keep getting wet walking between the two. The most likely scenario is a studio, office or workshop a short walk from the house. 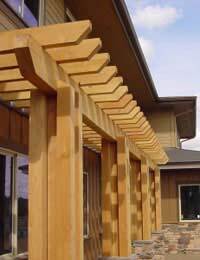 A pergola would offend no-one and plants can be grown up it to form a canopy but that does take a long time. This is really only worth doing if you aren't that interested in shelter and instead want to draw the eye along the path. Various commercial covered walkways are available. They are often metal frames with transparent plastic sheeting for the roof and are available in a wide variety of colours and forms. Whether or not planning permission would be necessary for a structure like this depends on the situation. If it is completely contained within your garden and doesn’t obstruct the view of any neighbours, then it is unlikely to need planning permission, but you must check. Planners would far rather be consulted at the beginning of a project than to have to go to all the bother of enforcement notices and retrospective planning applications. Currently planning permission for covered walkways tends to focus on how permanent the structure is, whether or not it is attached to the house, and the effect it will have on neighbours and the surrounding area. But planning guidelines differ from region to region and can change too, so a proper check with the people who run the system is the only way to be sure. A good half-way house is to have a pergola-style cover in wood and to roof it with natural material, either willow thatch, wooden slates or perhaps roof tiles. If you need one side covered, if the prevailing wind comes from a particular direction, you can use woven hazel or willow fencing panels. The result will blend into most landscapes so it will be less likely to offend anyone, but at the same time should provide adequate shelter for the walk across the garden.